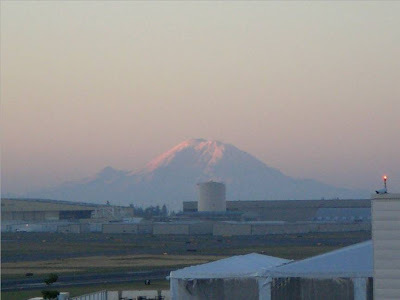 Mike has been on a business trip to Seattle since August 18th. He was supposed to be home on Saturday the 25th, however his trip was extended until last night. He was gone 12 loooooong days. We missed him so much ... especially Griffin. Every morning he would ask "Where's Daddy" and I would have to explain he was at work in Seattle. Well ... Mike got home last night ... and Griffin had already fallen asleep. So, this morning when Griffin woke up, Mike went into his room to bring him back to our bed for a little snuggle time. 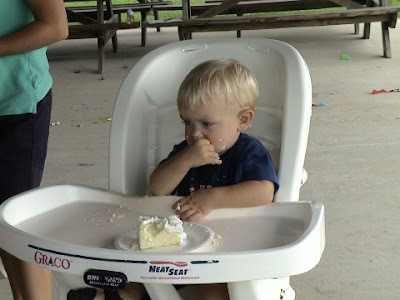 We had one happy little boy! Daddy's Home!!! Unfortunately Mike had to head off to work this morning. We would have LOVED him to stay home with us ... but that wasn't to be. Griffin got SO upset. Real tears and all. 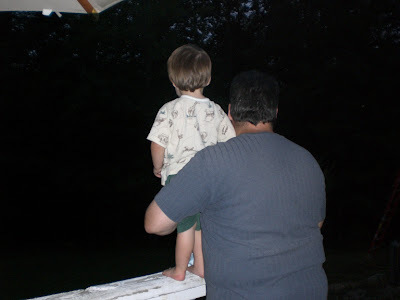 Daddy explained he was only going to work for a few hours and he would see him tonight. It was very, very sad and sweet at the same time. Our little guy is starting to understand when Daddy leaves. We are looking forward to some significant family time this weekend. We hope you all have a wonderful Labor Day Weekend. Wow ... that's all I can really say. Yesterday we went to Pocohontas State Park outside Richmond with Heidi (and her boys Ryan & Evan) & Leah (and her boys Kevin & Kenneth). We've never been there before ... I can not believe I did not know this place existed. The picture above shows one of the pool areas ... it's amazing! They have 4 pools, a water slide and an area in which the kids can play on the concrete with water towers shooting water in every direction. It's open Memorial Day through Labor Day ... you can bet we will be there alot next summer!! I still think my pick is Jennie Garth, or perhaps Marie Osmond. If you know me at all ... you know I'm a HUGE Dancing with the Stars fan. ABC supposed to announce live on Good Morning America the list of celebrities for this season on tomorrow's show. I have it Tivo'ing. Anyway ... TMZ.com had a list on their site today that they say is THE list. A day early. Woo Hoo! Wayne Newton - Vegas Baby! Nia Peeples - from FAME ... is this fair? Jennie Garth ... I've LOVE to see a woman win this season! 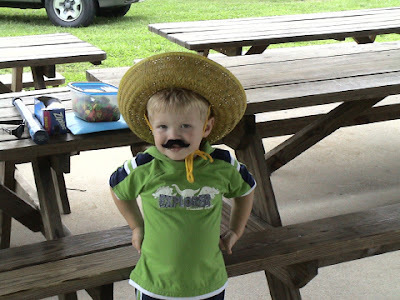 Our little amigo Evan turned uno on Sunday. 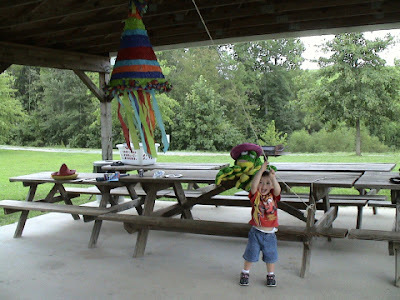 We were invited to his Birthday Fiesta at Hidden Rock Park. His mommy Heidi outdid herself. 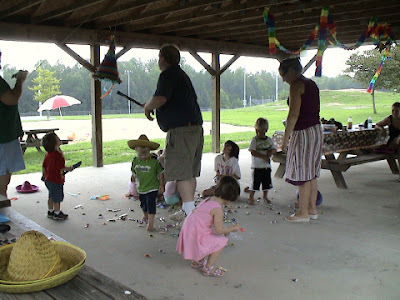 As I've mentioned, it was a Fiesta themed party ... complete with sombreros, fake mustaches, mexican themed bracelet making, and lots of party food! 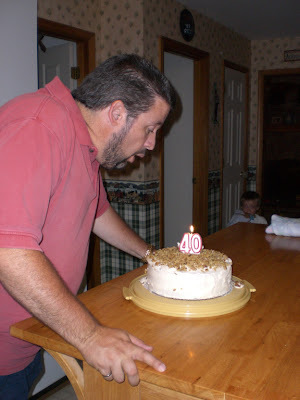 The fun and delicious birthday cake! 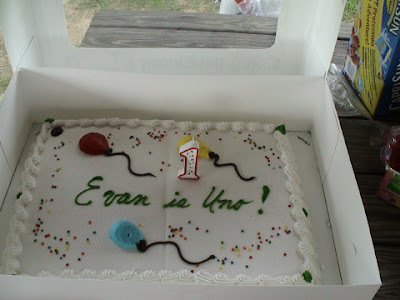 The Birthday Boy ... Evan! 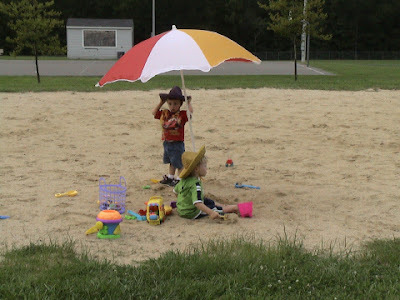 Griffin and Ryan playing in the sand ... we love Hidden Rock Park! 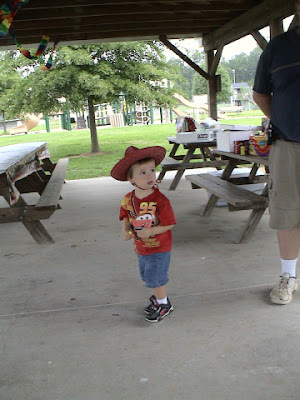 Griffin trying to get to the pinata! 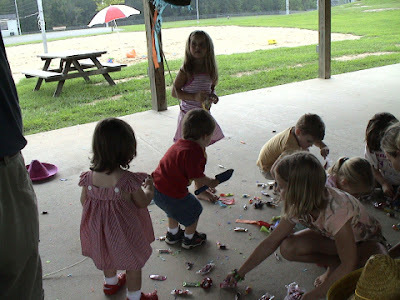 The kids scrambling for the pinata goodies! On Thursday we had some friends over for a playdate and pizza party. 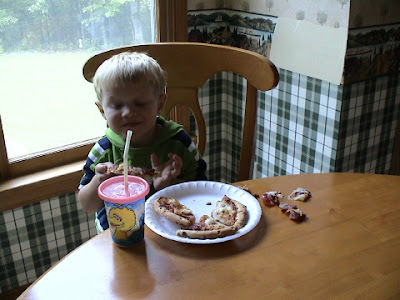 We let the kids play inside (it was too wet outside), then make pizzas for lunch and then after lunch we finally went outside to play on Fort Griffin. 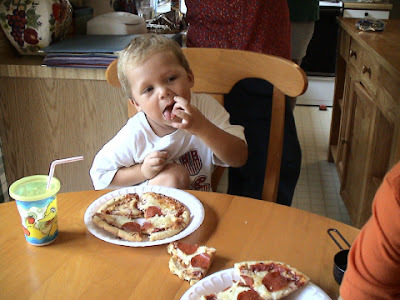 And this is Evan ... or Baby Evan as Griffin calls him. 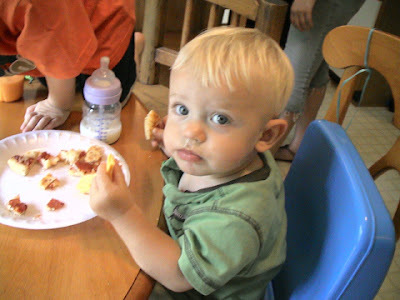 Evan will be 1 today (Sunday) ... so Happy, Happy Birthday Evan!! And these are the mommies ... well ... everyone except Latisha is a mommy (she's Darius' Aunt and Keisha's Sister). 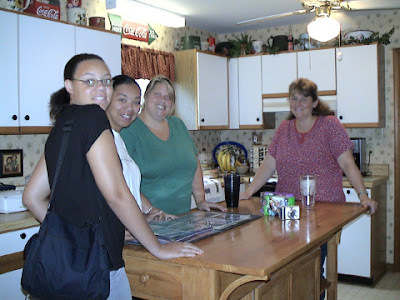 So from left to right ... Latisha, Keisha, Heidi and Carol. The ladies are all admiring Carol's scrapbook ... she is a phenomenal scrapbooker and I picked up ALOT of great ideas for my own scrapbook from her. 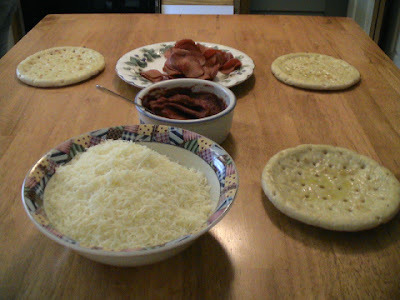 Pizza fixings ... I have to tell you ... this was SO much fun! 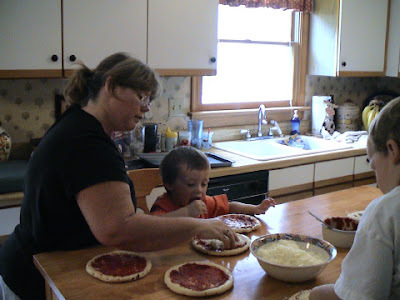 Me and Griffin making his pizza. 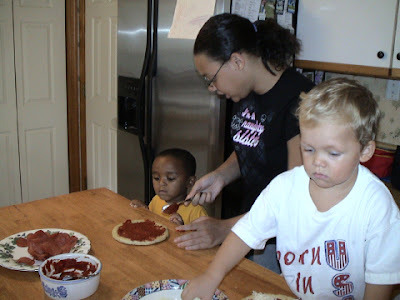 Darius, Latisha and Sam making their pizzas. Ryan decided he didn't want to make one, so we made it for him. All the boys playing near Fort Griffin. 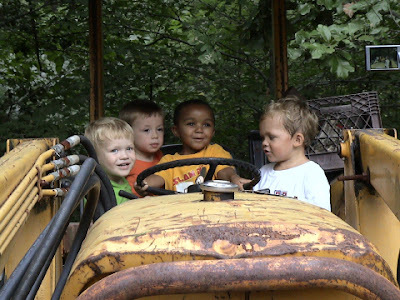 The "big" boys playing on the tractor. Just you wait ... Evan will soon be in this picture. I've always know that I have some really good friends in these ladies ... but Thursday just proved it even more. Thank you all for coming to our house! It's been awhile since I've had the chance to add anything new to Ebay. So today Today I took the time to create some new things. If interested, just click on my Ebay link on the right. Everyone wanted to know where the pictures are from the "water incident". Well, ya'll ... my camera was on a business trip with Mike in Seattle. Of course we do have a second camera ... but I would have had to run into the dining room and get it out of the camera case. I didn't think that was such a good idea at the time. I'm sad that I do not have pictures. Maybe I should have him re-inact the event. So ... the other day I needed to run upstairs to get a change of clothes before heading out for the day. Griffin was watching Sesame Street so I decided to just run up really quick to get what I need. When I was up there, I listened downstairs and thought ... mmmm ... he's watching Sesame Street, I will just brush my teeth while I am up here. As I am brushing my teeth, I hear hysterical laughing. Oh my goodness ... what is he doing? I run downstairs and discover Griffin sitting in the kitchen sink, having the time of his life as he is spraying the entire kitchen with the water spray nozzel. He was laughing so loud, and having so much fun. I'm slipping everywhere trying to get to him to get the spray nozzel away from here. I was laughing so hard ... it was impossible to get on to him. Of course, I made him help me clean up the flooded floor (as much as he could) and we once again talked about NOT opening the oven door to climb up on the counters. He is a pro at this ... let me tell you. The bad thing is ... he did it again this morning. We are having friends over for a playdate today, so I wanted to clean the downstairs bathroom before they get here. I'm in there cleaning (he's watching Sesame Street again) and all of a sudden the door closes to the kitchen. I really didn't think anything about it, because it's a little game he plays ... shutting the door and me asking to be let in. Anyway ... I thought ... mmmm ... that's probably not good. That booger was once again sitting in the kitchen sink ... spraying away. This time he got into trouble. There wasn't that much water on the floor this time ... and he KNOWS he is not supposed to do this. Any ideas about keeping him OFF the counters? He's most definately a climber and is quite good at it. I've tried an oven door lock ... they do not work ... once they get hot, it melts the glue away. Moms ... I'm all ears. 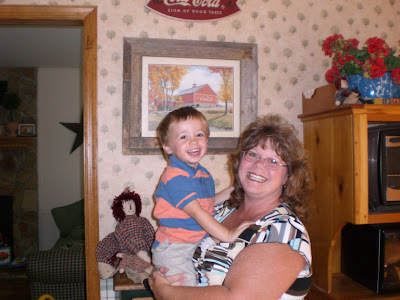 I was very, very honored to discover I had been honored with the "Inspiration Blogger Award" by Terri. Thank you Terri ... this means so very much to me. Now ... I would like to honor ALL of my readers with this award. You all so very inspirational in your own individual ways. Okay ... so I will try my very best to be a better blogger. I've been bad, BAD about blogging lately. I hereby PROMISE to try better. Now ... let's catch up. Thursday night we were hit with a terrible thunder/lightning/wind and rain storm here in Goochland. Oh my gosh ... it was SO bad and SO scary. I have experienced many, many of these kind of storms when we lived in Florida ... but this one was different. So very different. I was scared. Really scared. And it lasted for HOURS. It seemed to just stop over our house an not let up. The thunder was roaring through our trees ... the lightning was constant. The wind would not let up and finally ... the rain. So much of everything. Our power went off about 7:00 pm and did not come back on until Friday evening around 7:00 pm. We were without power for more than 24 hours. My ... how we take electricity for granted until we do not have it any longer. Mike started the generator so we were able to run the refrigerator, freezer, fans and tv. My friends Heidi (with Ryan and Evan) and Melinda came over for awhile as they did not have electricity either. We had plans to meet John (who works with Mike) and Cindy (his sweet wife) for dinner at The Hickory Knotch Grille. The Grille did not have electricity either, so we decided to meet them at the Red Robin in Short Pump instead. It was so much fun getting to know Cindy and John. They are GREAT people and SO much fun to be around. 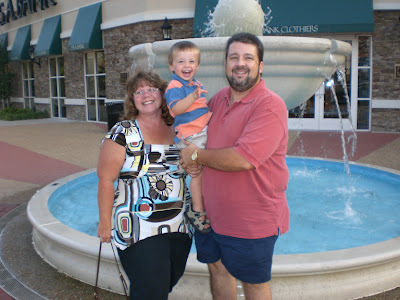 Cindy is 4 months pregnant ... and you can check out her blog too. On the right side of my blog just click on "Cindy" to find hers. After dinner we headed home and Mike put the generator away. After a little while, the power went out AGAIN ... oh no we thought ... here we go again. But it finally came back on about 5 minutes later. Saturday Griffin was invited to Eddie's birthday party at The Playroom. It was great fun. The kids played in the indoor playground, complete with jumpy houses. He had SO much fun!! Then Saturday in the late afternoon we met the Bishops (Heidi, Jeff, Ryan & Evan) at the YMCA for some swimming and pizza. Sunday we met the Bishops (we love spending time with them) at the Powhatan County Fair. For those of you that have been to the Citrus Festival in Florida ... the Powhatan County Fair is about one fourth the size of the Citrus Festival. But Griffin had alot of fun riding the rides and just being a boy. Monday found us needing to head to Sam's Club. Heidi, Ryan and Evan met Griffin and me there. Afterwards we went out to lunch at this GREAT Chinese Restaurant on Broad Street. Today ... Mommy & Me Gym time was back on. We haven't been there all summer because over the summer they have us in the dance studio and not the gym because they have summer camps in there. I hate (harsh word I know) it when they have us in the dance studio. It's just not the same. Anyway ... the air conditioner has been broken in the dance studio all summer, so we haven't been able to go. But today ... we were back in the gym! Yeah!! Everytime we passed the gym Griffin would say "go play" ... but we couldn't. Now, we can again on Tuesday and Wednesday. That's it ... all caught up ... except for a very sweet award I received from Terri. But I wanted to give that a post all by itself and I will tomorrow. And water. Just remember WATER. I will post on that very soon as well. 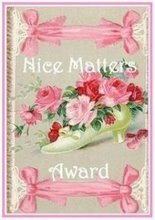 I was very honored to discover I've been presented with this "Nice Matters Award" from both Andi and Susie Q. This really, really, really means ALOT to me. Yes ... nice really does matter. In our fast paced world, it's so important to slow down, smile and BE NICE! Andi, Susie Q, Jen, Jolene, Sue from Tennessee, Teresa, Cassandra, Robin, Heidi, Cheryl, Wendy, Terri (TK Angels), Sheila, Lori (Colors Of Me), Julie, Tricia, Coleen, Leona, Sandy and my newest blogging friend Cindy (who I'm having dinner with Friday night). You've all touched my life and bring happiness and joy to my life when I read your blogs and when you leave comments. How is it I can create and manage a website ... but I can't figure out how to download a computer program? I guess it's like my not being able to read a road map either. Those are two things that I can NOT do. Reading a map just frustrates me. I just don't understand. Yes ... I see the names of the cities ... but trying to figure out which road we are on, or which road crosses us ... ugggggh .... it makes my stomach hurt. I was trying to be a nice wife and help download a program on our computer today for Mike, so he wouldn't have to do it when he gets home. And he really was trying to help me while we were on the telephone together ... but ... I just couldn't make it happen. Griffin is still sick. Poor Baby. He's had diarrhea since Thursday and started throwing up on Sunday. I took him to the doctor yesterday. Negative for strep. It's a virus that's going around right now. Today he's eaten a few bites of apple sauce, a couple of Ritz Bits ... and that's it. I'm trying to keep Water, Diet Sierra Mist and little sips of Gatorade in him. Our poor baby is sick. I want him feeling better ... and now. 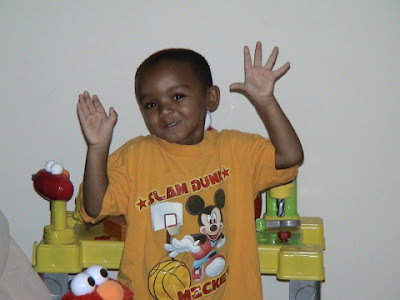 He's always on the move ... but you can definately tell when he's not feeling good ... he slows down. Oh ... 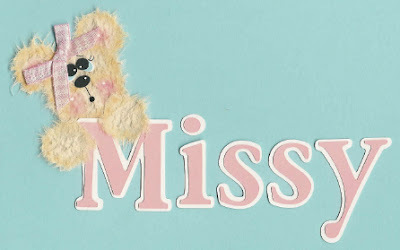 I wanted to share a little "Missy Made It" news too ... so many of my customers have asked to purchase my Tear Mulberry Bears directly without having to bid on Ebay for them. With that in mind ... I've listed some of my most popular Bears on my website (www.missymadeit.com) for direct purchase for a VERY limited time. If you are interested ... check it out!! I've decided to update my profile with this picture. I haven't changed it in 10 months ... the last one was of Griffin and me on Halloween last year. We have no big plans for this weekend ... just staying home. I'm going to get caught up on housework and probably work on some new Mulberry Bears. I hope you all have a GREAT weekend! 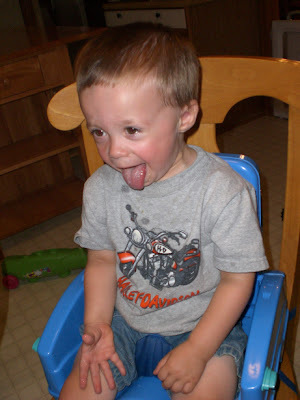 Yes ... Griffin is sticking his tongue out at our NOT so fun day. Last night around midnight our power went out due to a pretty severe lightning storm that came through. The storm seemed to last for hours. It got pretty hot upstairs without any air conditioning (due to the power outage), so Mike and I decided to head downstairs. I slept on the couch and he slept in his chair. It was a pretty restless night. The power came back on about 3:30, but you know when you are in of those "so comfortable you just don't want to move" moods, we opted to stay downstairs. About 5:00 am we headed back upstairs ... and I had a huge headache. We overslept and woke up about 6:30 and my head was still aching. Mike headed to the shower and I headed downstairs to make his lunch. Griffin was still sleeping ... that was quite unusual. Everyone got a shower and Daddy headed to work. About 8:00 am the power blinked about 3 times and went out agan. I did not want to stay home without any power. That meant no A/C, no TV, no cooking ... so we headed to Target. I called a neighbor while I was headed to Target to see if the power came back on and it had. So great! After Target we headed to the Goochland Library and then home. We were back home by 11:00 and my head was still pounding. I had taken an Aleve at 6:30 and was a bit scared to take anything else. I put Griffin in his bed hoping he would nap early. No such luck. Back downstairs we went. Finally at 1:00 he decided it was a"night, night" time. I tucked him in his bed. Then, I turned our ceiling fan on as high as it would go, climbed into bed and fell asleep. I slept until 4:00 pm and thank goodness ... the headache was gone when I woke up. Griffin was still sleeping, so I headed downstairs to make some iced tea for dinner. Thank goodness I had made spaghetti for dinner last night. Leftovers tonight for us. After dinner Mike headed to an Experimental Aircraft Association Meeting (EAA), Griffin went down for the night at 8:00 and I finally have time to read my email. Oh ... and Griffin has had diarrhea for 3 days. I feel so bad for him. He's eating fine, acting fine ... but ewwwwwwww!!! Apparently it's going around. Today I had planned to post about our weekend away to Chicoteague Island, but my camera battery decided to die and I have a very small window of opportunity to post something today. So ... I decided to post about one of my favorite things about living in Virginia. Living in Florida, I never, ever saw a firefly. Once we moved to Virginia every summer they pay us a visit. I so love fireflies with their tiny little lights that bring sparkle and whimsy to our summer nights. 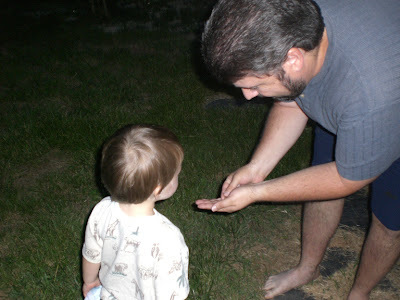 The other night Mike and Griffin stepped out on the deck to see the fireflies in action ... and then ... Daddy caught one so Griffin could see it up close and personal!! We had a great time on his birthday weekend ... we took a family trip to Chicoteague Island on the Eastern Shore of Virginia, where the wild horses live. I will share photos of our family trip next post. I am a HUGE Trading Spaces fan. I haven't seen a new episode in awhile, so I thought I would visit the Discovery/TLC website to see what was going on. I visited the message boards and everyone was speculating the show had been canceled and TLC did not want to announce it yet. Well ... mmmmm ... I thought ... what could I do to find out what was going on? So, I visited Frank's (my favorite designers) website to see if anything was posted there. 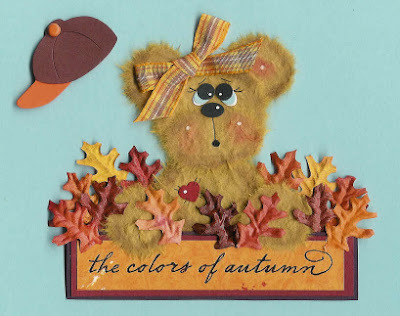 He and his wife Judy create this great cross stitch and tole painting line. So, I emailed them to see what was going on. And guess what???? Judy emailed me back!!! "Missy, Discovery has it on two stations now - TLC & Discovery Home. 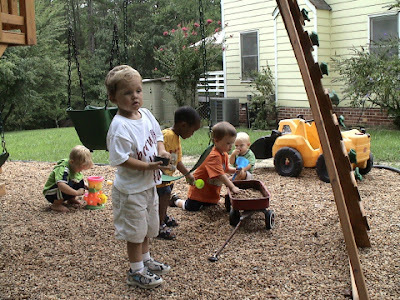 Go to www.Discovery.com and click on TLC - then on Trading Spaces and they will give you the schedule. Discovery decided to revamp the show - so there was a break - Frank is taping as I type. Thank You for being such a HUGE Fan. It is appreciated. As ever, Frank & Judy"
Oh my gosh ... I can't believe she emailed me back!! And to know that Trading Spaces is still around ... I'm soooo happy!! !